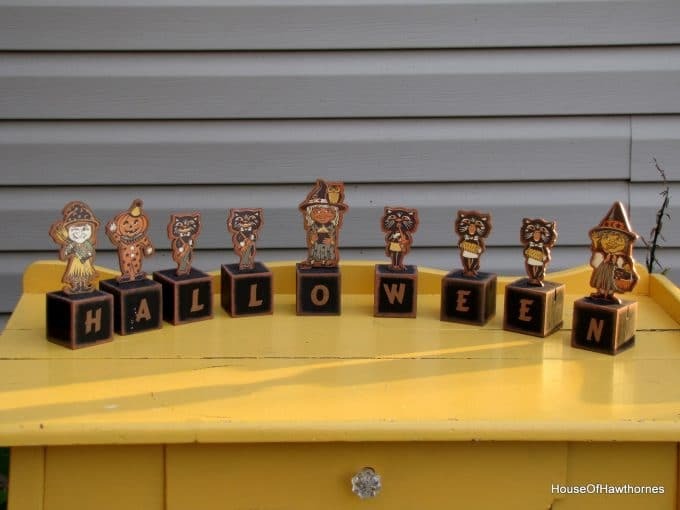 I love vintage Halloween items, but unfortunately they tend to be expensive and hard to find. Like these beauties that were originally shown in the July 2007 issue of Country Living Magazine. Look at the graphics on these boxes. If clowns weren’t creepy by nature, that candy container would be adorable (no offense meant to any clowns out there). These noise makers are so festive. 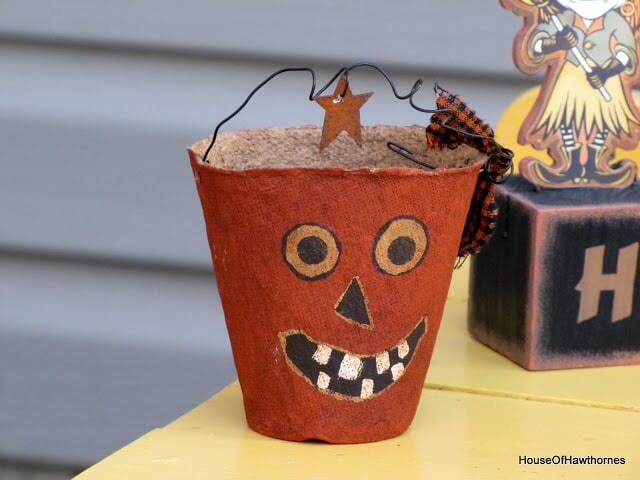 And the quirky grin on this pumpkin candy container makes me smile. Look at those teeth! So instead of true vintage, I tend to buy vintage inspired knock offs. 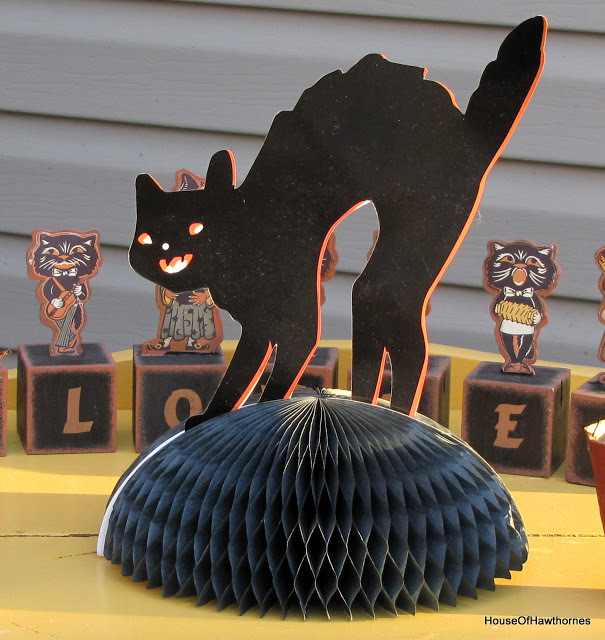 Like my honeycomb black cat. Meow! I bought him at Big Lots a few years ago, but he resembles the vintage ones. 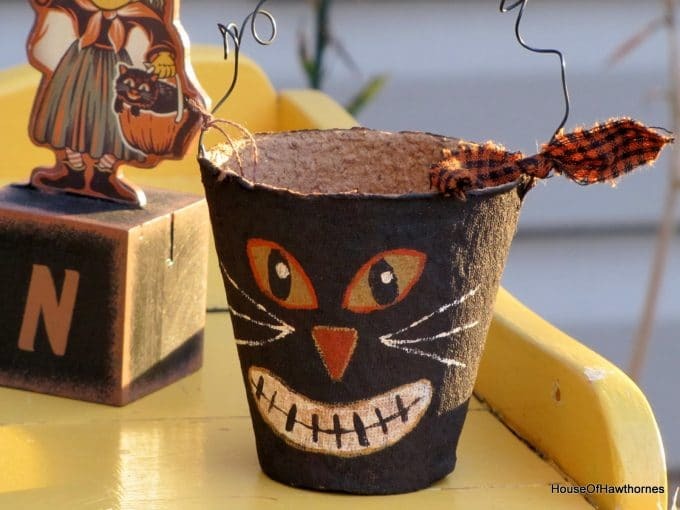 And these paper mache candy buckets remind me of the guy above with the quirky grin. My sister bought these vintage style blocks for me a few years ago. They spell out Halloween. I guess you can see that though. The images on these things are soooo representative of the era. So until I hit vintage Halloween heaven at one of my local thrift stores I’ll be buying the knock offs. Does this effect make them look more authentically vintage? I am linking to Debra’s Vintage Inspiration Friday party at Common Ground and My Romantic Home‘s Show and Tell Friday. 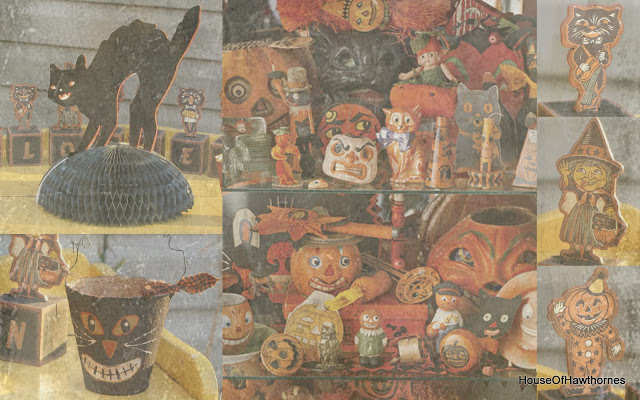 I am totally with you on loving vintage Halloween decorations! But, so do the serious collectors and the prices on most are sky-high now. I’ve seen some good reproduction pieces online similar to your honeycomb cat centerpiece. They remind me so much of the decorations we had when I was a kid – so much nostalgia – a much simpler time! Now, those little blocks with the figures on top – those are darling. Just too cute! And I think they have a very vintage feel. 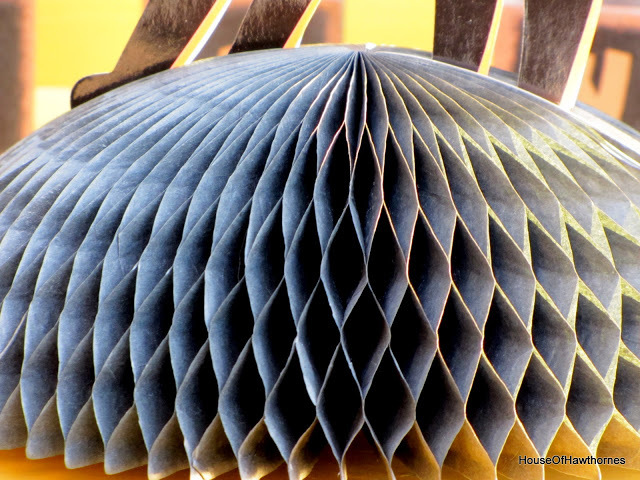 love the items you have…someday they will be vintage also! I love your vintage knock offs. The Halloween blocks are awesome. Sometimes you can’t tell the knock offs from the originals. Your finds are really cute! 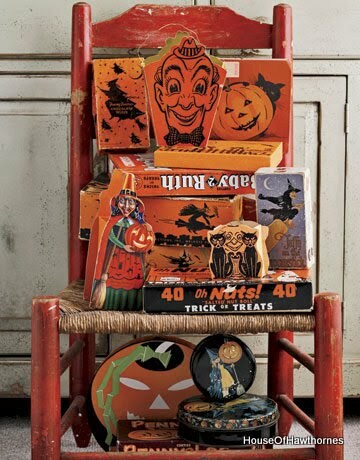 I love vintage Halloween stuff!!!! I really love your blocks too! Hey I got those carmel apples at Alsi last wek for $1.29 for 3!!!! Not bad!!! I meant to say Aldi! 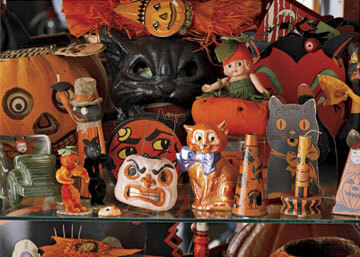 I love vintage Halloween, and you are right, when and if you find it, you can’t afford it. Those pictures from Country Living are great, though. I love your black cat and other vintage knockoffs. First let me say before I forget and hit post (which I sometimes do) that last photo would make terrific wrapping paper. Great effect! Now on to talk of shoes and ships and ceiling wax…I love the collection you’ve got started. My daughter collects vintage Halloween, but she mixes in the new things and done right…it’s hard to tell the difference. She would have a fit over those blocks. They are the cutest. Remember…someday yours will be vintage too! Your collection is really wonderful, and it DOES look very vintage. 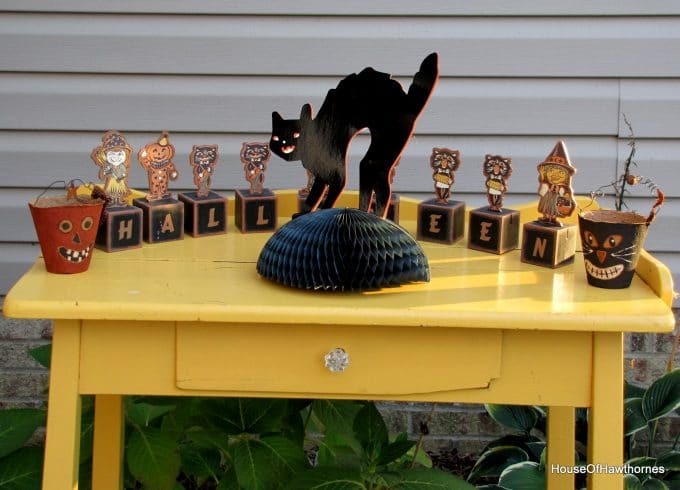 The prices of real vintage Halloween is thru the roof, so this works for me!! Thanks so much for linking up with VIF, really loved this post! 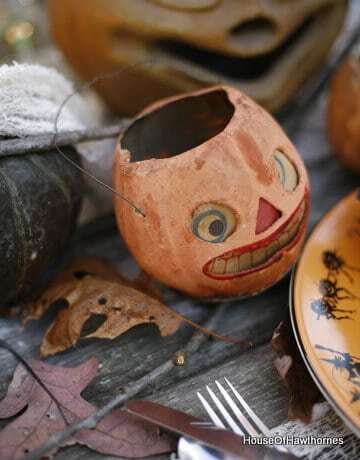 I love vintage halloween items! Images of witches from long ago have a more spooky feel about them! I wish I had bought older halloween items when I had the chance but didn’t. 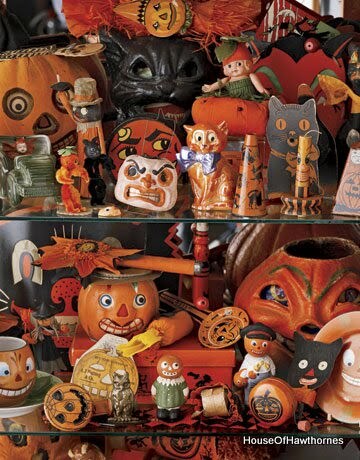 Oh…I love vintage Halloween stuff too. 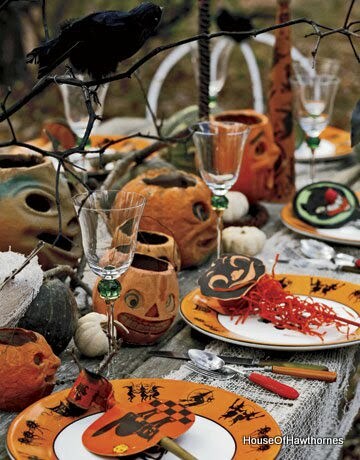 I always buy new Halloween things that look vintage. Target used to have some great things. They did have good paper goods this year but their decorations were not very vintage looking. Michaels too has had great items in the past but not this year. Loved this post. Come by my blog to see my vintage inspired Halloween decorating. 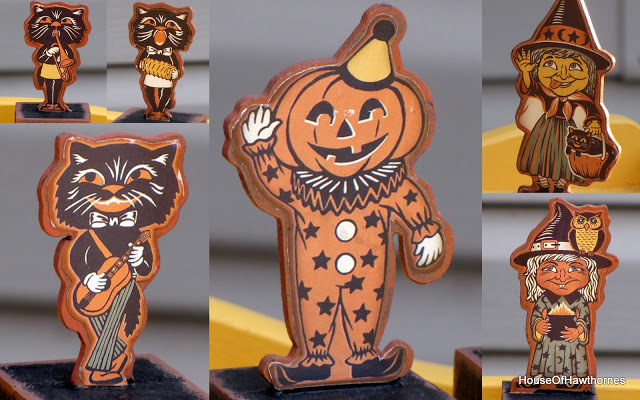 I love all the fun vintage Halloween items, too. I finally started tring to make it to meet my need to have items (that I couldn’t really find or afford).